Overend Watts: From 1969 to 1979 recorded and toured extensively with Mott the Hoople, Mott, and British Lions before shunning the limelight and turning his hand to record producing, gentlemen’s hairdressing (briefly! ), and dealing in antiques. At this point, however, most of his spare time was spent in the pursuit of large carp and he became a well-known figure on the gravel pits around the London area, where he always used luminous pink carp rods, so his mates, and the carp, could locate him easily! After a few years of antique fairs and auctions he concentrated on recycling and painting furniture and restoring antiques before opening a large “retro” department store in Hereford, which proved popular with customers from both Great Britain and abroad, with its specialist clothing, unusual antiquities, instruments, and rare music. 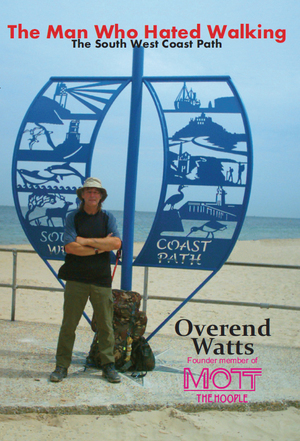 After leaving the retro store in February 2003, by way a of a change, Overend then aged 55, and The Man Who Hated Walking, attempted the SW Coast Path National Trail - the greatest challenge of his life - all 650 miles of it. Or in Overend’s case, more like 680 miles as he frequently got lost over the two months it took him to achieve this incredible feat of endurance. The Man Who Hated Walking, Overend’s first book is a wonderful document of this amazing achievement, which is explored and described with more than a smattering of his macabre humour. Although undoubtedly a book that all Mott The Hoople fans will want, it is also an essential read for the walking fraternity, and is undoubtedly a massive inspiration for anyone who has the urge to do some serious walking. Since backpacking the South West Coast Path, Overend also completed all of the other national trails including The Ridgeway, Offa’s Dyke, The Pembrokeshire Coast Path, The Thames Path, The South Downs Way, Hadrian’s Wall (3 times), The Saint’s Way, The North Downs Way, Peddar’s Way & Norfolk Coast Path, The West Highland Way, The Great Glen Way & The Speyside Way, The York Wolds Way, The Tabular Hills Walk, The Cleveland Way, The Oxford canal, The Southern Upland Way, Glyndwr’s Way, & Wainwright’s Coast to Coast. In 2008 he completed a marathon 1,250 mile walk from Land’s End to John O’Groats in 63 days - incorporating The Cotswold Way, The Heart Of England Way, Staffordshire Way, Limestone Way, Pennine Way, Cheviots, Grampians and Cairngorms. He also walked sections of many other trails, including The Two Moors Way, Gritstone Trail, Camel trail, and many others. Having passed away in January 2017, The Man Who Hated Walking is Overend's wonderful testament to the experiences that shaped the latter days of his life.